Price: £7.95 (incl VAT) Sorry, this item is currently unavailable. Click here to receive notification when this product comes back into stock. 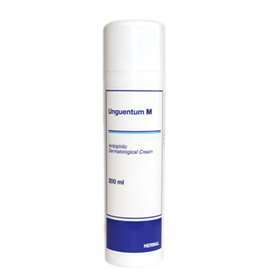 Unguentum M Pump Cream 200ml is a blend of Cream and Ointment. It is used to treat dry and damaged skin caused by conditions such as dermatitis, eczema, itchy skin known as pruritus, or dry harsh scaly skin known as ichthyosis. Make sure your hands are clean. Use a small amount of the Unguentum M cream and rub it into the affected area. If you apply too much, wash off the extra with water. You should apply this to the affected areas three times a day or as often as you need to. A good time to do this is after you have had a bath. Product code: 0262568 Price: £7.95 (incl VAT) Sorry, this item is currently unavailable. Click here to receive notification when this product comes back into stock.